Planning a Christmas party and want to grab guests' attention? Or want to send greeting cards without the hassle of licking stamps? 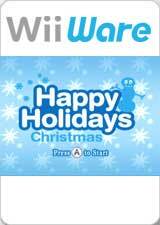 Here's the solution: Create and send fun Christmas cards with this unique WiiWare application. Happy Holidays: Christmas lets you make fun Christmas-themed e-cards and send them straight to friends' Wii consoles. Add a tree and decorations; choose frames, stickers and music; then write a message to friends you've registered in your Wii Address Book. It might not snow this Christmas, but with this fun new software your holiday is guaranteed to be a happy one. The graph below charts the compatibility with Happy Holidays: Christmas since Dolphin's 2.0 release, listing revisions only where a compatibility change occurred. This page was last edited on 17 January 2018, at 06:47.